The Aikido Orlando Dojo (AOD) - Martial Art and Family Health Center - is dedicated to promote healthy life style through Aikido. Aikido is a traditional self-defense non aggressive Japanese martial art. Its movements appear soft and flowing, but are at the same time very subtle and powerful. The art's techniques, while certainly effective for use in self-defense, develop awareness, intent, focus, coordinated movement, and physical engagement without the use of strength or resistance. AOD offers classes for adults, kids and “gentle Aikido” for people with physical or health limitations. In addition to traditional Aikido training, AOD also offers Yoga, Tai Chi, and FMS (Flexibility, Mobility and Strength) classes to promote holistic wellness. The Aikido Orlando Dojo is dedicated to sincerely spreading the knowledge and philosophy of Aikido's Founder Morihei Ueshiba, O Sensei. Our dojo Aikido linage comes from two major established Aikido organizations (United States Aikido Federation and Takemusu Aikido Association), with the intent and goal of providing a place for all students to train and work together to promote peace and harmony, the foundation of Aikido itself. 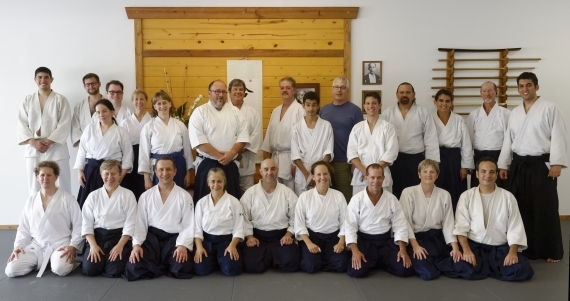 Our diversity makes the Aikido Orlando Dojo unique. Our teachers are courteous, dedicated, and sincere. Our students are open, friendly, and non-combative. The primary goal for our school is to provide a safe, positive, and open training atmosphere in order for sincere students to practice and explore the different paths to this joyous martial art of Aikido.